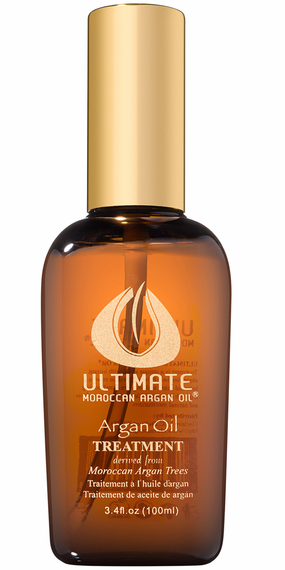 The ULTIMATE Moroccan Argan Oil® Treatment is a unique serum with instant absorption into hair and skin to create a beautiful shine and long-term conditioning. High in essential fatty acids, antioxidants (such as vitamin E and carotenes) and natural moisturizers, ULTIMATE Moroccan Argan Oil® Treatment can be instantly absorbed into hair and skin to heal, moisturize, restore shine and protect against environmental factors. A) After shampooing and conditioning, start with a small amount of ULTIMATE Moroccan Argan Oil® Treatment in the palm of your hands and work it through damp hair and style as usual. Apply a few drops as often as needed to achieve soft and shiny hair. B) Before applying color, massage approximately 5ml of ULTIMATE Moroccan Argan Oil® Treatment into hair. This will enhance the hair's ability to absorb the color. Do not rinse hair before applying color or bleach. Add 4 to 5ml of ULTIMATE Moroccan Argan Oil® Treatment to color mix and continue normal color application and process. Warm the ULTIMATE Moroccan Argan Oil® Treatment in your hands and massage your body 2-3 times a week. The skin will be hydrated and become smoother and softer after use.